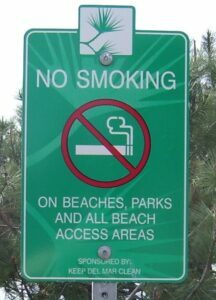 A smoke-free park or beach illustrates an environment of health, safety and fun. Smoking at the beach or park is especially dangerous to children as their lungs are still developing. 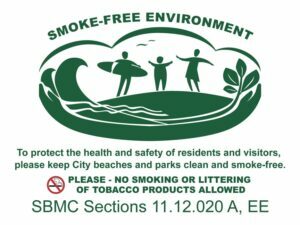 Exposure to secondhand smoke is just one reason why communities are adopting smoke-free park and beach laws. The trash created by cigarette butts litter is a significant environmental problem. They are hazardous and highly toxic to fish, birds, other wildlife, plus pets and young children if they are ingested. Fire danger is also a compelling environmental and safety reason why smoking is not allowed on beaches and in parks. Remember that tourists hailing from places that are not yet smoke-free may not know about this special San Diego amenity. And even a few locals may need a gentle reminder. Speak up if some is smoking in a protected zone, but remember to stay polite. The law is on your side, if you see a no smoking sign point to it. If all else fails, look for a park service employee, lifeguard, park ranger or law enforcement officer and tell them about the situation. If you don’t have a smoke-free parks law in your community, contacting your local elected official is the best way to have your voice heard. Join community members throughout San Diego who are speaking out. State law does not prohibit local governments from regulating tobacco use outdoors.